On Nov. 8, 1894, Ethel VanBibber, the orphaned daughter of William & Ann Mary Sutton Vanbibber, gave birth to a daughter. Barely fifteen years old, with no family and no husband, she found herself alone. The birth certificate named Clinton Strong as the Father but there is no reason to believe that beyond being present at the conception, he ever took a part in his daughter's life. We know nothing of the first 3 years of Artie Marie's life. We pick up the threads of her story in 1900, where Ethel and Artie Marie were recorded on the Warrick Co. census. 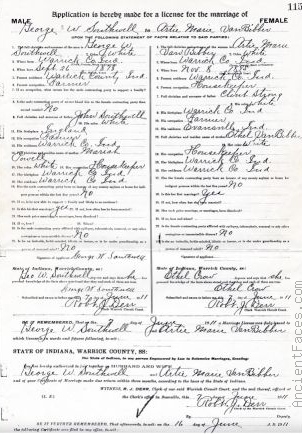 Ten years later, again from the census, we find Ethel, married to William Crow, with a Son, Hershel but no mention of Artie Marie who would have been thirteen. Years into my research of this family I finally found an answer to the question......where was Artie Marie? The discovery of a Marriage License issued to Artie Marie and George Southwell. We know from birth records that her birthdate had been falsified and she was in fact only 13 when she married George who was 20 years her senior. We next found Artie Marie in the Wesley Chapel Cemetery. She died in 1918, barely twenty one years old. The saddest part of this story is that Ethel had kept Artie Marie's birth a secret from even the closest family members. My Mother-in-law who would have been Artie Marie's Aunt swears no one in the family had ever heard of her. There is probably much more to her story that we will never know. Many questions left unanswered. I'm just thankful that I could do for her in death what no one had done for her in life......acknowledge that she is truely......OURS. NOTE; Artie Marie is buried beside her Husband, George. From Artie Marie's Birth certificate and marriage license we know her Father was listed as Clinton Strong and further investigation tells us that Clinton was the Stepson of Delia Van Bibber Strong, the Sister of Ethel's Grandmother, Martha Van Bibber Sutton.